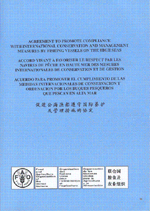 Certified true copy of the English, French, Spanish, Arabic and Chinese versions of the Agreement to Promote Compliance with International Conservation and Management Measures by Fishing Vessels on the High Seas, approved on 24 November 1993 by Resolution 15/93 of the Twenty-Seventh Session of the FAO Conference. (f) "vessels entitled to fly its flag" and "vessels entitled to fly the flag of a State", includes vessels entitled to fly the flag of a Member State of a regional economic integration organization. 1. Subject to the following paragraphs of this Article, this Agreement shall apply to all fishing vessels that are used or intended for fishing on the high seas. (b) shall not apply to the obligations undertaken by a Party under paragraph 1 of Article III, or paragraph 7 of Article VI of this Agreement. 3. Without prejudice to the provisions of paragraph 2 above, in any fishing region where bordering coastal States have not yet declared exclusive economic zones, or equivalent zones of national jurisdiction over fisheries, such coastal States as are Parties to this Agreement may agree, either directly or through appropriate regional fisheries organizations, to establish a minimum length of fishing vessels below which this Agreement shall not apply in respect of fishing vessels flying the flag of any such coastal State and operating exclusively in such fishing region. (a) Each Party shall take such measures as may be necessary to ensure that fishing vessels entitled to fly its flag do not engage in any activity that undermines the effectiveness of international conservation and management measures. (b) In the event that a Party has, pursuant to paragraph 2 of Article II, granted an exemption for fishing vessels of less than 24 metres in length entitled to fly its flag from the application of other provisions of this Agreement, such Party shall nevertheless take effective measures in respect of any such fishing vessel that undermines the effectiveness of international conservation and management measures. These measures shall be such as to ensure that the fishing vessel ceases to engage in activities that undermine the effectiveness of the international conservation and management measures. 2. In particular, no Party shall allow any fishing vessel entitled to fly its flag to be used for fishing on the high seas unless it has been authorized to be so used by the appropriate authority or authorities of that Party. A fishing vessel so authorized shall fish in accordance with the conditions of the authorization. 3. No Party shall authorize any fishing vessel entitled to fly its flag to be used for fishing on the high seas unless the Party is satisfied that it is able, taking into account the links that exist between it and the fishing vessel concerned, to exercise effectively its responsibilities under this Agreement in respect of that fishing vessel. 4. Where a fishing vessel that has been authorized to be used for fishing on the high seas by a Party ceases to be entitled to fly the flag of that Party, the authorization to fish on the high seas shall be deemed to have been cancelled. (ii) no authorization for such fishing vessel to be used for fishing on the high seas has been withdrawn by another Party within the last three years. (b) The provisions of subparagraph (a) above shall also apply in respect of fishing vessels previously registered in the territory of a State which is not a Party to this Agreement, provided that sufficient information is available to the Party concerned on the circumstances in which the authorization to fish was suspended or withdrawn. (c) The provisions of subparagraphs (a) and (b) shall not apply where the ownership of the fishing vessel has subsequently changed, and the new owner has provided sufficient evidence demonstrating that the previous owner or operator has no further legal, beneficial or financial interest in, or control of, the fishing vessel. (d) Notwithstanding the provisions of subparagraphs (a) and (b) above, a Party may authorize a fishing vessel, to which those subparagraphs would otherwise apply, to be used for fishing on the high seas, where the Party concerned, after having taken into account all relevant facts, including the circumstances in which the fishing authorization has been withdrawn by the other Party or State, has determined that to grant an authorization to use the vessel for fishing on the high seas would not undermine the object and purpose of this Agreement. 6. Each Party shall ensure that all fishing vessels entitled to fly its flag that it has entered in the record maintained under Article IV are marked in such a way that they can be readily identified in accordance with generally accepted standards, such as the FAO Standard Specifications for the Marking and Identification of Fishing Vessels. 7. Each Party shall ensure that each fishing vessel entitled to fly its flag shall provide it with such information on its operations as may be necessary to enable the Party to fulfil its obligations under this Agreement, including in particular information pertaining to the area of its fishing operations and to its catches and landings. 8. Each Party shall take enforcement measures in respect of fishing vessels entitled to fly its flag which act in contravention of the provisions of this Agreement, including, where appropriate, making the contravention of such provisions an offence under national legislation. Sanctions applicable in respect of such contraventions shall be of sufficient gravity as to be effective in securing compliance with the requirements of this Agreement and to deprive offenders of the benefits accruing from their illegal activities. Such sanctions shall, for serious offences, include refusal, suspension or withdrawal of the authorization to fish on the high seas. Each Party shall, for the purposes of this Agreement, maintain a record of fishing vessels entitled to fly its flag and authorized to be used for fishing on the high seas, and shall take such measures as may be necessary to ensure that all such fishing vessels are entered in that record. 1. The Parties shall cooperate as appropriate in the implementation of this Agreement, and shall, in particular, exchange information, including evidentiary material, relating to activities of fishing vessels in order to assist the flag State in identifying those fishing vessels flying its flag reported to have engaged in activities undermining international conservation and management measures, so as to fulfil its obligations under Article III. 2. When a fishing vessel is voluntarily in the port of a Party other than its flag State, that Party, where it has reasonable grounds for believing that the fishing vessel has been used for an activity that undermines the effectiveness of international conservation and management measures, shall promptly notify the flag State accordingly. Parties may make arrangements regarding the undertaking by port States of such investigatory measures as may be considered necessary to establish whether the fishing vessel has indeed been used contrary to the provisions of this Agreement. 3. The Parties shall, when and as appropriate, enter into cooperative agreements or arrangements of mutual assistance on a global, regional, subregional or bilateral basis so as to promote the achievement of the objectives of this Agreement. (f) power of main engine or engines. 3. Each Party shall promptly notify to FAO any modifications to the information listed in paragraphs 1 and 2 of this Article. 4. FAO shall circulate periodically the information provided under paragraphs 1, 2, and 3 of this Article to all Parties, and, on request, individually to any Party. FAO shall also, subject to any restrictions imposed by the Party concerned regarding the distribution of information, provide such information on request individually to any global, regional or subregional fisheries organization. 6. Where information is given to FAO under paragraph 5(b) above, the Party concerned shall specify which of the reasons listed in that paragraph is applicable. (b) any agreement reached under paragraph 3 of Article II. (a) Each Party shall report promptly to FAO all relevant information regarding any activities of fishing vessels flying its flag that undermine the effectiveness of international conservation and management measures, including the identity of the fishing vessel or vessels involved and measures imposed by the Party in respect of such activities. Reports on measures imposed by a Party may be subject to such limitations as may be required by national legislation with respect to confidentiality, including, in particular, confidentiality regarding measures that are not yet final. (b) Each Party, where it has reasonable grounds to believe that a fishing vessel not entitled to fly its flag has engaged in any activity that undermines the effectiveness of international conservation and management measures, shall draw this to the attention of the flag State concerned and may, as appropriate, draw it to the attention of FAO. It shall provide the flag State with full supporting evidence and may provide FAO with a summary of such evidence. FAO shall not circulate such information until such time as the flag State has had an opportunity to comment on the allegation and evidence submitted, or to object as the case may be. 9. Each Party shall inform FAO of any cases where the Party, pursuant to paragraph 5(d) of Article III, has granted an authorization notwithstanding the provisions of paragraph 5(a) or 5(b) of Article III. The information shall include pertinent data permitting the identification of the fishing vessel and the owner or operator and, as appropriate, any other information relevant to the Party's decision. 10. FAO shall circulate promptly the information provided under paragraphs 5, 6, 7, 8 and 9 of this Article to all Parties, and, on request, individually to any Party. FAO shall also, subject to any restrictions imposed by the Party concerned regarding the distribution of information, provide such information promptly on request individually to any global, regional or subregional fisheries organization. 11. The Parties shall exchange information relating to the implementation of this Agreement, including through FAO and other appropriate global, regional and subregional fisheries organizations. The Parties shall cooperate, at a global, regional, subregional or bilateral level, and, as appropriate, with the support of FAO and other international or regional organizations, to provide assistance, including technical assistance, to Parties that are developing countries in order to assist them in fulfilling their obligations under this Agreement. 1. The Parties shall encourage any State not party to this Agreement to accept this Agreement and shall encourage any non-Party to adopt laws and regulations consistent with the provisions of this Agreement. 2. The Parties shall cooperate in a manner consistent with this Agreement and with international law to the end that fishing vessels entitled to fly the flags of non-Parties do not engage in activities that undermine the effectiveness of international conservation and management measures. 3. The Parties shall exchange information amongst themselves, either directly or through FAO, with respect to activities of fishing vessels flying the flags of non-Parties that undermine the effectiveness of international conservation and management measures. 1. Any Party may seek consultations with any other Party or Parties on any dispute with regard to the interpretation or application of the provisions of this Agreement with a view to reaching a mutually satisfactory solution as soon as possible. 2. In the event that the dispute is not resolved through these consultations within a reasonable period of time, the Parties in question shall consult among themselves as soon as possible with a view to having the dispute settled by negotiation, inquiry, mediation, conciliation, arbitration, judicial settlement or other peaceful means of their own choice. 3. Any dispute of this character not so resolved shall, with the consent of all Parties to the dispute, be referred for settlement to the International Court of Justice, to the International Tribunal for the Law of the Sea upon entry into force of the 1982 United Nations Convention on the Law of the Sea or to arbitration. In the case of failure to reach agreement on referral to the International Court of Justice, to the International Tribunal for the Law of the Sea or to arbitration, the Parties shall continue to consult and cooperate with a view to reaching settlement of the dispute in accordance with the rules of international law relating to the conservation of living marine resources. 1. This Agreement shall be open to acceptance by any Member or Associate Member of FAO, and to any non-member State that is a Member of the United Nations, or of any of the specialized agencies of the United Nations or of the International Atomic Energy Agency. 2. Acceptance of this Agreement shall be effected by the deposit of an instrument of acceptance with the Director-General of FAO, hereinafter referred to as the Director--General. 3. The Director-General shall inform all Parties, all Members and Associate Members of FAO and the Secretary-General of the United Nations of all instruments of acceptance received. 4. When a regional economic integration organization becomes a Party to this Agreement, such regional economic integration organization shall, in accordance with the provisions of Article II.7 of the FAO Constitution, as appropriate, notify such modifications or clarifications to its declaration of competence submitted under Article II.5 of the FAO Constitution as may be necessary in light of its acceptance of this Agreement. Any Party to this Agreement may, at any time, request a regional economic integration organization that is a Party to this Agreement to provide information as to which, as between the regional economic integration organization and its Member States, is responsible for the implementation of any particular matter covered by this Agreement. The regional economic integration organization shall provide this information within a reasonable time. 1. This Agreement shall enter into force as from the date of receipt by the Director--General of the twenty-fifth instrument of acceptance. 2. For the purpose of this Article, an instrument deposited by a regional economic integration organization shall not be counted as additional to those deposited by Member States of such an organization. Acceptance of this Agreement may be made subject to reservations which shall become effective only upon unanimous acceptance by all Parties to this Agreement. The Director-General shall notify forthwith all Parties of any reservation. Parties not having replied within three months from the date of the notification shall be deemed to have accepted the reservation. Failing such acceptance, the State or regional economic integration organization making the reservation shall not become a Party to this Agreement. 1. Any proposal by a Party for the amendment of this Agreement shall be communicated to the Director-General. 2. Any proposed amendment of this Agreement received by the Director-General from a Party shall be presented to a regular or special session of the Conference for approval and, if the amendment involves important technical changes or imposes additional obligations on the Parties, it shall be considered by an advisory committee of specialists convened by FAO prior to the Conference. 3. Notice of any proposed amendment of this Agreement shall be transmitted to the Parties by the Director-General not later than the time when the agenda of the session of the Conference at which the matter is to be considered is dispatched. 4. Any such proposed amendment of this Agreement shall require the approval of the Conference and shall come into force as from the thirtieth day after acceptance by two-thirds of the Parties. Amendments involving new obligations for Parties, however, shall come into force in respect of each Party only on acceptance by it and as from the thirtieth day after such acceptance. Any amendment shall be deemed to involve new obligations for Parties unless the Conference. in approving the amendment, decides otherwise by consensus. 5. The instruments of acceptance of amendments involving new obligations shall be deposited with the Director-General, who shall inform all Parties of the receipt of acceptance and the entry into force of amendments. 6. For the purpose of this Article, an instrument deposited by a regional economic integration organization shall not be counted as additional to those deposited by Member States of such an organization. Any Party may withdraw from this Agreement at any time after the expiry of two years from the date upon which the Agreement entered into force with respect to that Party, by giving written notice of such withdrawal to the Director-General who shall immediately inform all the Parties and the Members and Associate Members of FAO of such withdrawal. Withdrawal shall become effective at the end of the calendar year following that in which the notice of withdrawal has been received by the Director-General. (iv) withdrawals from this Agreement pursuant to Article XIV. The Arabic, Chinese, English, French, and Spanish texts of this Agreement are equally authentic.